reminder: mendocino farm hack this weekend! 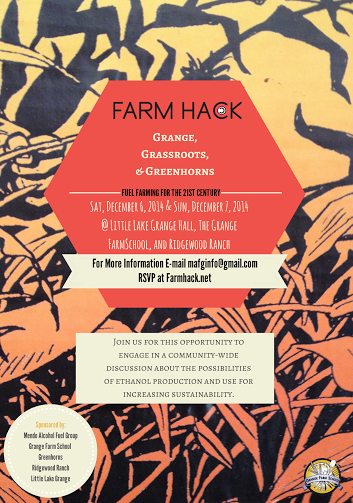 Mendocino County will host its first FarmHack at the Little Lake Grange and Ridgewood Ranch in Willits, CA this December 6-7. This weekend long event will bring together business owners, engineers and mechanics, farmers and home-scale producers to learn about the possibilities of ethanol production and use. A series of workshops, panel discussions, and demonstrations will provide a comprehensive knowledge of this renewable, sustainable fuel source with an emphasis on how we as a community can collaborate and reduce our waste stream and our petroleum addiction. Leave a Comment on reminder: mendocino farm hack this weekend! california grange future tour dates! Leave a Comment on california grange future tour dates! iowa city: the next ecopolis?? 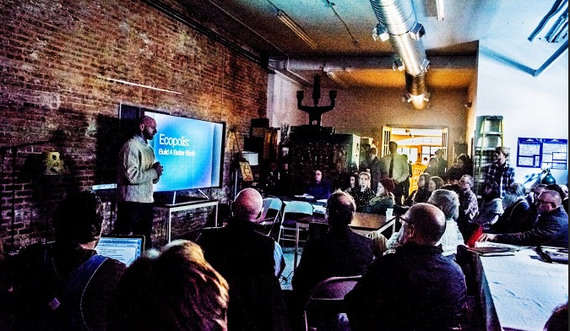 A broad range of community members in Iowa City, Iowa kicked off the “Ecopolis Forum” today, a groundbreaking series of monthly winter conversations on creating the first regenerative city of the arts, food, renewable energy, and commerce in the heartland. Laying out a design for a regenerative showcase in the riverfront district of Iowa’s former historic capital, which gained national attention for its community response torecord flooding in 2008, Schultz called on participants to rethink Iowa City’s sense of place and nature, as well as imported sources of food, sprawling transport systems, and an aging grid dependent largely on fossil fuel energy and subsequent waste in enduring periods of record drought, flooding and changing climate. Leave a Comment on iowa city: the next ecopolis?? dignified life for farm workers and a more humane, transparent food chain. farming apprenticeship at growing heart farm!! Growing Heart Farm (growingheartfarm.com) is hiring a young farmer or farming team to operate 1.5 acres in cultivation for the 2015 growing season. Private 2 bedroom apartment provided on our 41 acre farm 1 mile from metro north train station in Wingdale, NY. We are open to a range of experience levels, however, this position is ideal for a farmer looking to graduate from apprenticeship and take the reigns of their own operation. We have an established Manhattan based CSA and some small local markets. Infrastructure includes drip irrigation, fencing, horse barn, 2 small greenhouses, coolers, delivery van, BCS, mower, and general implements, etc. We have incubated 5 seasons of young farmers and we just received our soil tests, which mark substantial improvements in soil fertility. The fields are currently in cover crop having just finished our growing season. 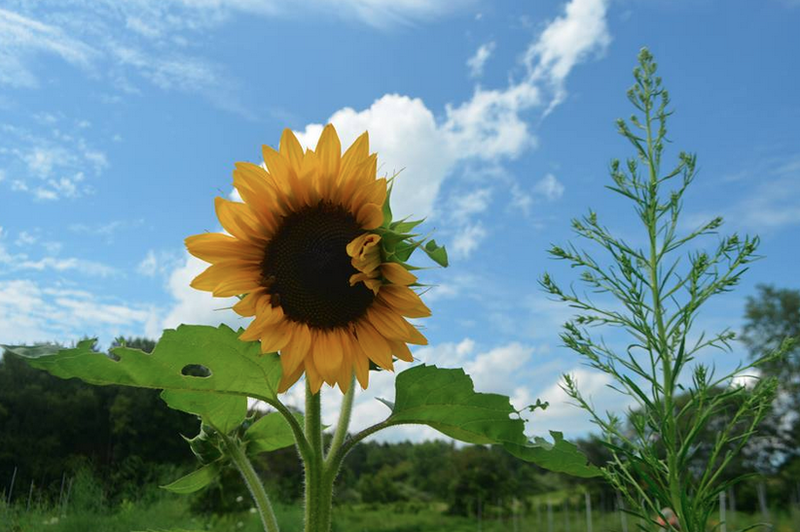 The farm hosts numerous events including farm to yoga (pics) and a variety of other retreats largely attended by visitors from New York City and surrounding areas. Please visit our Website or Facebook page to get a better sense of our community. We are very collaborative and open to new ideas as we explore new models of sustainability. please contact lewis (at) growingheartfarm.com with inquiries. Leave a Comment on farming apprenticeship at growing heart farm!! The demands are ambitious and utopian, but also simple and straightforward because they deal with the basic rights of a human being in a civil society. They provide practical policy responses the systemic injustice that has been so fully revealed in the public eye over the last couple of years, but also probe at our assumptions of how the state, the police force, and the citizen are meant to interact. Read the full list of demands HERE. There’s a new resource for learning about how to grow good, sustainable food, who’s growing it, and how you can better understand your place in the new ecosystem we’re all trying to build: EthicalFoods Magazine. Ethical Foods is looking out for your health, the renewability of the earth, and sharing farmers’ insights with the world. So they have articles about the challenges of organic certification and difficulties faced by urban farmers, as well as profiles of individual farms, and interviews with people farming the land right now. They also have a Sustainable Kitchen Guide, to help newcomer green up their own cooking process. But don’t let us tell you about it: check it out yourself. And of course you can follow them on Facebook and Twitter. Mark Bittman’s article in the New York Times, Nov. 25, 2014. There are four basic ways to change the food system. I talk about three of them a lot: The first is to eat differently, focusing on good food and especially plants; the second is to bring change to your work, whether that means becoming a farmer or helping other people eat better through your role as a teacher, doctor, artist, techie, lawyer or journalist. The third is to work locally to effect change in, for example, school systems or municipal politics. The fourth is the toughest: Change the system that governs everything, including food. This means changing dominant economic theories and practices, and indeed the nature of capitalism itself. That isn’t happening anytime soon. mendocino farm hack, dec 6-7. 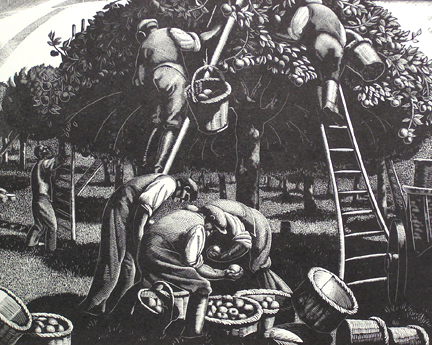 Leave a Comment on mendocino farm hack, dec 6-7.